Karlene K. Stewart is a blogger and writer of both fiction and non-fiction, who lives in the sunny Cayman Islands. Her many books include philosophical and inspirational titles, but her latest offering is for young children, with the exciting Imaginative Joe Dreamer series, which is aimed at helping young children to learn how to problem solve and build up their confidence. Her influences come from her favorite authors; the inspirational writer Joel Osteen and the ever-popular writer of children’s literature, Dr. Seuss and she plans to continue with her eclectic titles with follow up books in the near future. Joe Dreamer and His Easter Bunny is a holiday-themed picture book for children written by Karlene Stewart and illustrated by Telmo Sampaio. Joe Dreamer loved springtime. For one thing, his birthday was celebrated during that season, but even more exciting for Joe was the Easter holiday. Joe loved the Easter-related artistic activities that they had in school, including drawing decorated Easter eggs, and he wondered if their upcoming field trip would include sightings of rabbits. Joe didn’t get to see rabbits on his field trip, but he did get to make one when they did crafts. He told his mom about that when he got home, and she had some exciting news for him as well. They would all be going to an Easter Fair that Saturday. Mom promised that there’d be egg hunts and Easter-themed sweets, and they’d all have lots of fun. Above all, Joe hoped he’d get to see the Easter Bunny. 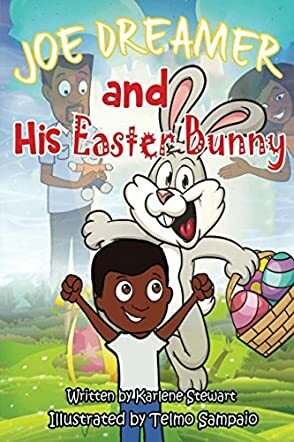 Karlene Stewart’s holiday-themed picture book for children, Joe Dreamer and His Easter Bunny, is an entertaining tale about a six-year-old boy who loves Easter and the Easter Bunny. The reader gets to share Joe’s excitement as he celebrates Easter in school and at the Easter Fair, where his parents have a special surprise waiting for him. Telmo Sampaio’s illustrations are awesome! There’s any number of bunnies, decorated eggs and other decorations for kids to marvel over, and they’re all beautifully and brightly colored. There’s even a bunny running through Joe’s classroom that careful readers will enjoy spotting. This book is chock full of great ideas for art projects for kids and is a perfect selection for new readers to try on their own as well. Joe Dreamer and His Easter Bunny is most highly recommended. Joe Dreamer and His Easter Bunny by Karlene Stewart is a cute story about the love of the Easter Bunny. Joe has just turned six and he is very excited about celebrating Easter. His imagination is filled with bunnies and rabbits. Joe’s mom and dad take him to the local Easter Fair for an egg hunt and lots of sweet treats. But all little Joe really wants is to see the Easter Bunny. A big surprise waits for Joe at the park; could it be his Easter Bunny? Karlene Stewart’s Joe Dreamer and His Easter Bunny was simple, easy to read out loud and stayed on the theme of the Easter Bunny from beginning to end. The main character was unique in his fascination with and desire to see the Easter Bunny. The plot setting moved from home to school and the great outdoors. The story has very little dialogue; the narrative voice focuses more on Joe’s feelings, hopes and thoughts. I appreciated that the story included his parents; they were loving and caring and helped shape Joe’s character. As with all children’s books, I sat down with my grandchildren and we read Joe Dreamer and His Easter Bunny together. My grandkids enjoyed the fact that Joe liked to draw, but didn’t like that Joe was easily saddened and bored when things didn’t go his way. I commend the illustrator, Telmo Sampio; the pictures are bright and full of primary colors and related well to the words of the story. My grandson stated that he liked the pictures the best. Overall, we were happy that Joe’s dream came true in the end.